First Communion is a ceremony in some Christian traditions during which a person first receives the Eucharist. It is most common in the Latin Church tradition of the Catholic Church, as well as in many parts of the Lutheran Church and Anglican Communion. In churches that celebrate First Communion, it typically occurs between the ages of seven and thirteen, often acting as a rite of passage. Catholics believe this event to be very important, as the Eucharist occupies a central role in Catholic theology and practice. First Communion is not celebrated in the Eastern Orthodox churches, the Oriental Orthodox churches, or the Assyrian Church of the East, as they practice infant communion (which often is simultaneously administered with infant baptism and confirmation). 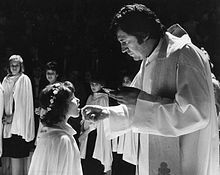 Some Anglicans allow infant communion, while others require the previous reception of confirmation, usually during the teenage years. Celebration of this ceremony is typically less elaborate in many Protestant churches. Catholics and some Protestants believe that Christ is truly present in the Eucharist, although only Catholics and some Anglo-Catholics of the Anglican Communion believe this is through transubstantiation. Other denominations have varying understandings, ranging from the Eucharist being a symbolic meal to a meal of remembering Christ's last supper. Traditions of celebration surrounding First Communion usually include large family gatherings and parties to celebrate the event. The first communicant wears special clothing. The clothing is often white to symbolize purity, but not in all cultures. Often, a girl wears a fancy dress and a veil attached to a chaplet of flowers or some other hair ornament. In other communities, girls commonly wear dresses passed down to them from sisters or mothers, or even simply their school uniforms with the veil or wreath. Boys may wear a suit and tie, tuxedo, their Sunday best, or national dress, with embroidered arm bands worn on the left arm and occasionally white gloves. In many Latin American countries, boys wear military-style dress uniforms with gold braid aiguillettes. In Switzerland, both boys and girls wear plain white robes with brown wooden crosses around their necks. In Spain, Germany, Luxembourg, Austria, and Guam, girls are dressed up as little brides, although this has been partly replaced by albs in recent times. In Scotland, boys traditionally wear kilts and other traditional Scottish dress which accompany the kilt. In the Philippines, First Communion services often occur on or around the Feast of the Immaculate Conception (the country's patron saint), with boys donning either the Barong Tagalog or semi-formal Western dress, and girls a plain white dress and sometimes a veil. Gifts of a religious nature are usually given, such as rosaries, prayer books, religious statues, icons, and holy cards. Monetary gifts are also common. Many families have formal professional photographs taken in addition to candid snapshots in order to commemorate the event. Some churches arrange for a professional photographer after the ceremony. During the communist era, initiation into the pioneer movement in communist countries that had large Catholic populations was an overt attempt to supplant the Catholic ritual (e.g., the Union of Pioneers of Yugoslavia). In all cases, a child at the age of seven to ten is initiated as a member of a group within which the individuals share certain values and culture. The decorated bread is a gift for the Catholic Church from children who had their first Communion in Poland. ^ Kerby, Jill (May 3, 2016). "First Communion Windfalls Need Careful Harvesting". Munster Express. Archived from the original on January 3, 2018. Retrieved January 2, 2018. 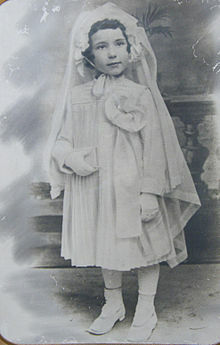 Wikimedia Commons has media related to First Communion. This page was last edited on 29 March 2019, at 15:42 (UTC).